The Jetboil Zip and Jetboil Flash serve the same purpose, but the two cousins are not the same. The type of portable cooking system you choose during your adventures depend on a variety of factors such as whether you are traveling solo or as a group, being minimalist or traveling with all the convenience you can afford to take with you. To help you make the best decision for your situation and needs, we present a comparison of the features of the Jetboil Zip and Jetboil Flash. Its 100g Jetpower fuel can boil 10 liters of water. Made for the minimalist solo traveler. Its 100g Jetpower fuel can boil 12 liters of water. 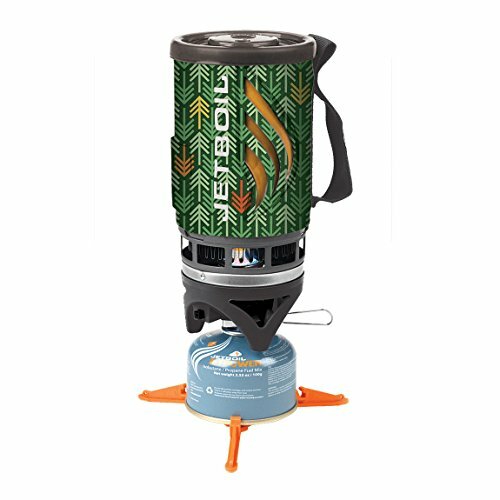 Bottom Line Up Front: If you just want my hot take, I’d recommend going with the Jetboil Flash available here. It offers push button ignition and smart color indicators for heat levels, well worth the small additional cost. Which is the Better Stove? At 0.8 Liters, the size of theJetboil Zip shows it is made for the minimalist solo traveler. You may experience some overflow issues at first, but you will learn the perfect water level to achieve the task with regular use. However, you should keep in mind that Jetboil Zip is designed for one person. While it can boil water to last you for two months, it may have problems serving two people. Compared to the Jetboil Flash, the Jetboil Zip is 1.1 ounces lighter due to its smaller size and a half inch shorter. The Zip will be lighter to carry on long hikes. With a 1 Liter volume to hold more liquid, the Jetboil Flash is designed to serve a larger number of travelers. While the Flash is 1.1 ounces heavier than the Zip, it can comfortably boil water for two. It’s easier to handle the extra load since two people can take turns to carry it. However, the fuel stabilizer for both stoves weighs 0.9 ounces. The ignition systems in the Jetboil Zip and Jetboil Flash are the main difference between the two products. You need a match or gas lighter to ignite the Jetboil Zip, and this presents a few challenges. It means you have to pack matches and you need a place sheltered from the wind before you can cook. The advantage is that the match ignition system is extremely reliable, so long you can light a match. Just don’t forget to pack the matches before heading out. On the other hand, the Jetboil Flash uses a push-button ignition. This innovation eliminates the need for packing matches and enables you and fellow travelers to cook in windy conditions since there’s no fear of matches being blown off. Cooking with the Flash neither requires packing matches nor a wind-sheltered environment. The problem with a push-button ignition is that it’s not as reliable as a match ignition system after some time. Despite its ease of use, many users of the Jetboil Flash report that the push-button ignition fails after prolonged use. Even though Jetboil claims the push-button ignition on the Flash is reliable, it’s advisable to pack a match or gas lighter in case the ignition system fails you. Not being able to get the fire going can be a big deal when you are camping out in the cold. One of the unique features of the Jetboil Flash is that it features Jetboil’s proprietary color change indicator. While this great feature makes the Flash more functional and advanced, the Zip misses the feature due to its smaller size. The Color Change Indicator is a small strip on the side of the Flash that shows you when the liquid inside has reached boiling point by changing from gray to yellow. This indicator can help save time and fuel by helping users knows when it’s time to shut off the burner. With this feature, you can save up to 30 seconds when boiling water on the Jetboil Flash. However, the Jetboil Zip lacks the indicator strip and can take up to 2.5-3 minutes to boil water. The time and fuel-saving features are one of the outstanding features that can sway your decision when shopping for a cooking system. While camping on a chilly mountain crest, a hot cup of coffee can seem like the best thing in the world; you need your stove to be fast and efficient. On the Jetboil Zip stove, boiling 0.5 liters of liquid takes about 2.5 minutes. On the other hand, the Jetboil Flash takes only 100 seconds to boil 0.5 liters of liquid. If boiling speed is a big deal for you, then the Flash is the faster of the two. Plus, it boils more liquid. The heat regulator valves are one of the most significant differences between the Jetboil Zip and the Jetboil Flash. 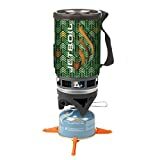 Jetboil uses a plastic valve in the Zip, a material that can’t stand the test of time, plus the fact that the valve is small and can be a bit challenging to handle for people with large fingers or sweaty hands. Additionally, you need to be extremely cautious when using the valve due to its proximity to the heat source. On the other hand, the Flash comes with a more durable metallic heat adjustment valve. The valve in the Flash is safer to use as it’s placed farther away from the heat source. You have more surface grip as the valve flips out of the stove, making adjustments easier and safer. The two stoves use an identical stainless steel burner as a heat source. However, the exterior design of the Flash is more stylish compared to the Zip. For easy packing and traveling, the burner is detachable, and a traveler can store it in the cup when not in use. Both burners are practically the same, save for the more appealing exterior on the Flash burner. 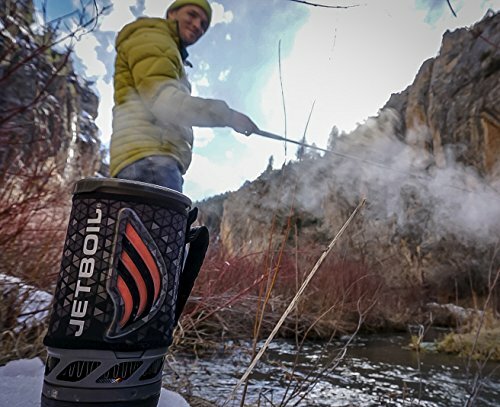 The two Jetboil stoves are built with heat retention in mind. 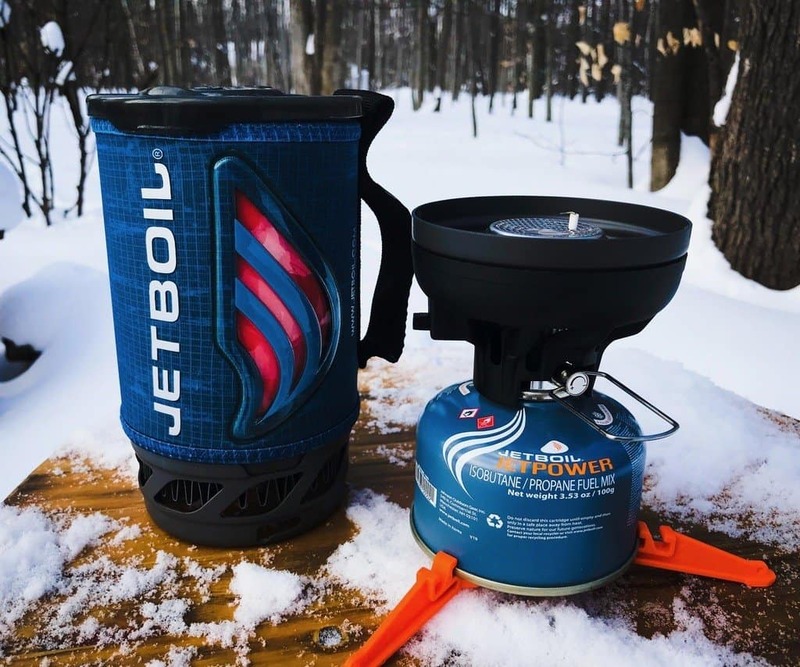 Both Jetboil stoves come with an anodized aluminum pot for cooking. The content of the pot is kept hot by a neoprene cozy. The top lid and bottom cover of the pot are made from highly-durable BPA-free plastic. These materials help the cooking systems to withstand the rigors of outdoor travel and also enable them to retain heat to keep your foods and drinks hot. Regarding material and durability, both the Zip and Flash are evenly matched. A Jetboil Jetpower fuel powers both the Jetboil Zip and Jetboil Flash. The Zip appears to be more fuel efficient as its 100g Jetpower fuel can boil 12 liters of water. On the same amount of fuel, the Flash burns 10 liters of water, a whopping 2 liters short of the Jetboil Zip. However, the Flash is about 30 seconds faster than the Zip. If fuel efficiency is more important to you, the Zip is the more efficient cooking system. However, the Flash is faster and has more volume. Your decision depends on the number of travelers you need to feed. 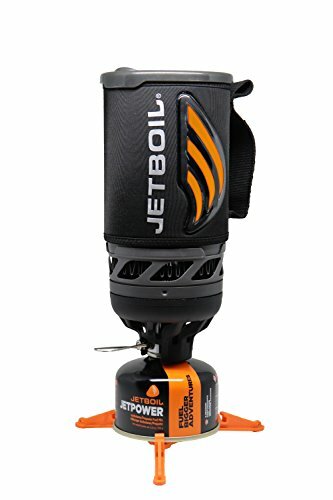 Both stoves feature Jetboil’s stabilizer, a bright orange, three-pronged apparatus that keeps the cooking system upright when cooking on uneven surfaces so you can cook your food without fear of the stove tipping over. For increased heat retention, the Zip’s FluxRing cooking pot features an insulating cozy. It also has a drink-through lid which also serves as a strainer and pour spout. The Flash also features an insulated cozy over its FluxRing cooking pot, a multipurpose lid as well as a bottom cover which doubles as a measuring cup and bowl. The Jetboil Zip is compatible with all Jetboil accessories such as the company’s fry pan, coffee press, and others, but the Flash is compatible with only a few Jetboil accessories, so it’s important that you check for compatibility before purchasing any accessory if you choose to buy a Flash cooking system. 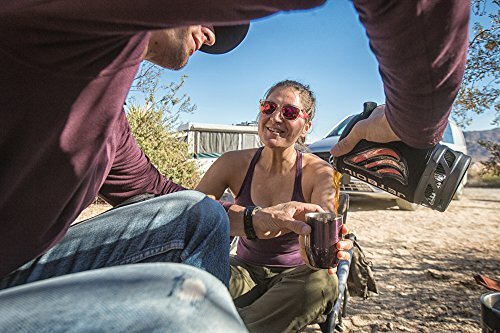 The Jetboil Flash is the better choice of the two, especially when traveling with a group of people. The Flash is faster, cooks more in less time, has a convenient push-button ignition, and a thermochromatic indicator that lets you know when what you are cooking has come to a boil. However, the Jetboil Zip may be the ideal traveler’s stove if you are alone. The Zip is smaller, slightly lighter and exceptionally durable. 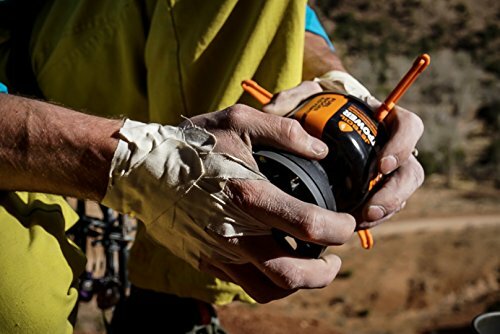 Due to their lightweight and compact design, both stoves are perfect for outdoor travel activities such as hiking, paddling, camping, and backpacking. They come with enhanced features such as the stabilizer tripod, igniters, energy efficiency, as well as adjustable stove burners. The two cooking systems are extremely fast and will get your food ready in less than five minutes. This means you can quickly cook your food and you don’t have to worry about being bogged down with weight or packing because they are light and the design is compact. The Flash also save some space as the bottom cover of the pot serves as a measuring cup or bowl, so you don’t have to pack an extra one. The heat retention capacity of the two cooking systems is excellent due to the durable materials used to build them and the insulating cozy at the top of the pot. Note that you need to buy the gas canister separately if there are legal restrictions on shipping inflammable materials. Also, it’s important to buy a 100-gram gas canister as the stoves are designed for that canister size.